Bryan Alders (@bryanalders) is the Social Media Coordinator for TrainingPeaks. In the past 12 months, he has more than doubled our following on Facebook, Twitter, LinkedIn, Instagram and Google+. Congratulations! You’re one step ahead of many endurance coaches: You have a couple social media accounts and you’re actively using them. Being on social media is going to help you grow your business by allowing you to communicate with your clients and find new customers. Now, let’s make sure you’re getting the most out of your social media presence. Here are four of the best ways you can use social media to grow your endurance coaching business. The most “liked”, “shared” and “favorited” posts on our social media channels at TrainingPeaks are our blog articles. Why? Because they are helpful to our customers. As an endurance coach, you’re in the business of helping your athletes achieve their athletic goals. Don’t have enough time to create your own training articles? It only takes a few seconds to share or retweet articles from the endurance sports industry or produce a “quick tip” that will help your athletes. Bonus Tip: Create a Twitter List of the top publishers, journalists, pro athletes and other influencers in endurance sports. They will always be tweeting and posting their most recent articles and industry news. It’s then easy to look at this list and find articles and topics that you may want to share. One of the best things about social media is that it can give insight into one’s true personality. You’re not the only triathlon, cycling or running coach out there, but you are running a successful business. So what makes you unique? Maybe it’s your knowledge of how sleep affects performance. Maybe it’s your experience with cooking or nutrition. Maybe it’s just your sense of humor. Your area of expertise separates you from the rest, and is your most interesting characteristic. So tell us what you do better than the rest. We’ve all seen someone try and sell themselves or their products in an inauthentic manner. You can sense it, and it never makes you jump up from your seat and buy what they’re selling. Would you click on what you’re about to share? Be yourself, and others will engage with your content. There’s nothing more exciting for a coach than witnessing his/her athletes get the results they were looking for. A top performance from an athlete also indicates that you’re good at what you do. This is the perfect opportunity to tell people about it. It’s “acceptable bragging” and congratulating your athlete for a job well done, all at the same time. After the weekend’s races or after an athlete sets a new PR, share their results on social media. There’s a good chance your athlete has already done so themselves too, so this may be as simple as clicking the “retweet” or “share” button on their post. Sharing content is a great way to present information to your followers, but as your significant other would say, maybe “You never listen.” You’ve potentially heard it before but I’ll repeat it, social media is about two-way communication. Spend a portion of your time on social media listening to what others are saying. Whether it’s your athletes, the top pros, or other endurance coaches, listen to what they’re saying and what’s important to them. Remember, this is the audience you’re trying to connect with and knowing their interests will help you deliver more valuable content. While you’re listening, don’t forget to retweet or share things that you think will interest your audience, and comment or reply to posts when you feel you have something to say. If you don’t feel like you have much to say, a simple “like” or “favorite” lets others know you’re listening. Lastly, respond to those who mention you. You never know where a conversation started on social media may lead. 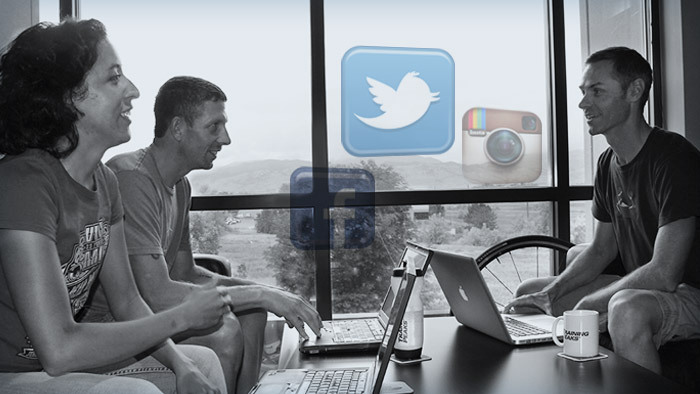 Have you ever asked TrainingPeaks a question on Facebook or Twitter? I’ll almost always reply, and aim to do so in less than 30 minutes. Bonus Tip: Social media tools, like Hootsuite and Sprout Social, are exceptional for “listening”. They also allow you to monitor and post to all your social media channels in one convenient place, schedule posts, and have the option to track keywords. Try tracking keywords like “triathlon coach” or “running tips” and jump in and respond when you feel you have something to add to the conversation. Take a quick look back at each of these four suggestions. They’re fairly straightforward, and they should be—social media doesn’t have to be complicated. I think of it as embodying the characteristics you would want in a good friend: helpful, authentic, excited and engaged in your conversation. So what are you waiting for? I’ll even help you get started. Here are our three most successful blog posts from this past month. Take a read through, and if you find any of them useful, go ahead and use the social media buttons at the top to share this training advice with your athletes. Use photos whenever possible. 93 percent of the most engaging posts on Facebook are photos1. Post your content when your followers are online. Based on our audience of endurance athletes, this is between 6:00 a.m. and 8:00 p.m. on weekdays, with 2:00 p.m. being your peak opportunity. Use social media apps and their notification features. Twitter and Facebook will both notify you when someone tags your business or leaves a comment. This allows you to reply in a very timely manner. Do not link your social media accounts—in other words, posting the same message simultaneously across platforms. It’s antisocial, inauthentic, and looks bad3. This isn’t to say you can’t post a very similar statement across all your social media platforms, just spend a few extra minutes to use the unique advantages of each channel to its fullest extent.